Find a secluded oasis with state-of-the art amenities on Michigan’s most famous island. 7	GRAND TRAVERSE RESORT & SPA | Traverse City Genuine service, smarter-than-ever technology and exceptional activities—all in one luxurious setting. 13	BOYNE RESORTS | Boyne Country Flexible lodging and meeting spaces, stellar service, a vast range of world-class activities—plus beauty everywhere you turn. Proven strategies from a renowned meeting planner to make your next conference more meaningful. Editorial & Advertising Offices 125 Park Street, Suite 155 Traverse City, MI 49684 Phone: 231.941.8174 | Fax: 231.941.8391 Subscriber Services Visit MyNorth.com/sub to change your address or to review your account. 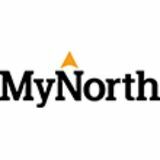 Please e-mail other subscription inquiries to info@mynorth.com or call 800.785.8632 between 10 a.m. and 8 p.m. EST. 19	GRAND HOTEL | Mackinac Island Legendary attention to service and style, in a venue so gracious and beautiful, it can only be called grand. Northern Michigan Area Airports and Advertiser Directory. Reprints Reprints available. Please call 231.941.8174. Welcome to our Neighborhood. Welcome to the very vibrant and very cool downtown Traverse City waterfront neighborhood called the Warehouse District. It’s the place we call home. Come stay with us! Enjoy the modern design, lush bedding, spa-inspired showers, inspiring function spaces, free Wi-Fi, fresh cuisine, local craft beverages and live entertainment. Meet at Michigan’s Premiere Winery Estate 160 acres of indoor and outdoor meeting and event spaces, catering, and fine wine. Come for a day meeting, celebratory dinner, or multi-day retreat at the Inn. putting course with real bent-grass greens. After dusk, guests can try their hands at glow-in-the-dark putt-putt. Mission Point is also home to a gracious outdoor swimming pool, onproperty bike rentals, and kite flying. When venturing off the resort, guests can easily explore the beauty and history of Fort Mackinac, take a carriage ride, and—most definitely—sample some fresh fudge! Or, simply enjoy a drink on the great lawn while watching freighters pass in the Straits of Mackinac. Offsite: The resort’s position on the east side of the island offers a perfect sunrise vantage point. Mission Point offers a stunning sunrise hike—an incredible way to start the day. When out on your bike, don’t be afraid to break free from the perimeter and explore the trails that weave the island’s interior. There are a variety of beautiful limestone formations hidden throughout the wilder woodlands of the island. Rooftop Spots When itâ&#x20AC;&#x2122;s time for a breakout session, soak up breezes and a birdâ&#x20AC;&#x2122;s-eye view of an unforgettable Up North landscape. These stunning rooftop venues in Northern Michigan offer your group the perfect oasis. Call ahead for reservations and the precise services to meet your needs. Sip a craft cocktail or a glass of rosé on the upstairs deck while you scope out downtown. The charcuterie and cheese board from the in-house butchery is only the beginning of the delicious casual cuisine you can expect. Serving authentic Mexican Cuisine and a view of Lake Superior. Get Dos Equis on draft along with the famous Parrillada Mexicana Fajita. Located across the street from West Grand Traverse Bay, this full-service rooftop bar and dining area has an unmatched view. There aren’t many who would turn down a pineapple jalapeño margarita paired with a summer sunset. Enjoy a glass of Bowers Harbor Pinot Grigio or a Diabolical IPA from North Peak with a chopped brisket sandwich and your creative juices are sure to be flowing. Just follow the alluring smell of handmade pizza to the rooftop of Pangea’s Pizza. Built in 2018, this new space has a view of the bay and some of the best slices in town. Oh, and the loaded fries—outstanding. Take the elevator up to the sixth floor at the Landmark Inn and find yourself face to face with the Marquette skyline and Lake Superior. The rooftop terrace offers an unforgettable view of Lake Michigan, portable bar service for events and 4,200 square feet of space. You may come for the award-winning burger and beerbattered fries, but you’ll stay for the sweeping view of Little Traverse Bay. This local hot spot is serving Japanese and French fusion cuisine in downtown Ludington. Pair the volcano sushi roll with lemongrass sake on the upper-level deck. New Holland rum, Traverse City cherries, fresh mint, and Vernors come together in the signature cocktail: The Michigan Mojito. Pair with the oak-plank whitefish and the scenic view of the winding Pine River. MEET HERE. PLAY HERE. RETREAT HERE. Bay Harbor Village Hotel and Conference Center is the prime Northern Michigan destination for your conference or meeting. With flexible spaces, customizable catering options, stunning views, world-class amenities, and a wide variety of seasonal events, itâ&#x20AC;&#x2122;s the perfect place to mix business with pleasure. Come and enjoy the breathtaking views at our inviting condominium hotel or one of our charming rental homes. Relax and enjoy waterfront dining, shopping and soak in the amazing sunsets on Lake Michigan. 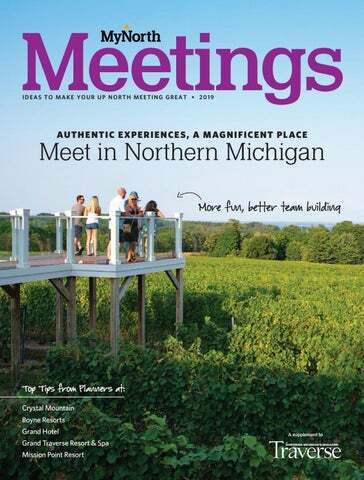 Grand Traverse Resort is the largest meetings destination in Northern Michigan, and offers the best of all worlds: a luxurious setting with a simultaneously relaxed atmosphere. “We smile at everybody in the halls,” says Public Relations Manager Jillian Manning. Grand Traverse Resort is a place where you can enjoy both your family and your colleagues—sometimes together. “We’re seeing more meeting guests bringing their families to the resort, so they can enjoy off-time from the conferences together,” says Manning, and Grand Traverse Resort staff makes sure both adults and kids have fun and relax. “You’re able to get so much more out of the experience when you can engage in a variety of ways and not just in the conference room,” says Manning. WHO TO KNOW Director of Sales Ryan Buck has worked in the hospitality industry for almost 25 years at properties in Traverse City, Chicago, Miami Beach, and San Francisco, with the last five years at Grand Traverse Resort. WHAT TO DO Onsite: Alongside their award-winning golf courses, spa, and dining, Grand Traverse Resort invites you to enjoy bonfires on the beach, fly fishing lessons, and an indoor water playground. Your event design manager works with you and your team to develop the kind of activities and experiences that will exactly fit the tone and scope of your meeting. In the past, some groups have even run 5Ks for charity and held group yoga classes on the beach. Offsite: Should you be interested in exploring, groups enjoy the resort’s assistance in navigating Sleeping Bear Dunes National Lakeshore, winery tours, canoeing and kayaking, and the very popular kayak and brew tours, which are basically pub crawls on water! Grand Traverse Resort is adept at arranging activities, transportation options, and more. Staffers are happy to recommend specific vendors, restaurants, and destinations. Off the beaten path: Maple Bay Farmhouse and Natural Area is a beautiful pocket of nature, preserved by the Grand Traverse Regional Land Conservancy. Located less than ten minutes from the Grand Traverse Resort, Maple Bay is an opportunity to enjoy the outdoors and Lake Michigan. Depending on the season, visitors can hike, cross country ski, swim, or hunt. HOT TIP Grand Traverse Resort’s newly renovated Governor’s Hall is able to comfortably host meetings of over 2,000 people. The hall is also equipped with new state-of-the-art technology for both sound and visual aids. MEETINGS MODERNIZED New look, long history. For over 30 years, Governors’ Hall at Grand Traverse Resort and Spa has been Northern Michigan’s premier meeting destination. Newly renovated with updates to technology, services, and design—along with a brand-new meeting planner office—Governors’ Hall is ready for the future. See the transformation at grandtraverseresort.com/governorshall. How to create a group activity your crew will actually love? Find ways to bond in the fun and the sun, Up North, of course. Here are six sure bets. DO A DIY FOODIE SCAVENGER HUNT Send teammates on a mission, then meet up at a public park for one amazing picnic feast using Northern Michigan ingredients. Maxbauer’s Meat Market in Traverse City has house-smoked brats, sausages, hot dogs, jerky—the goods. Head to Fustini’s for fresh oils and vinegars. Find artisan loaves at Bay Bread. Pick up local smoked whitefish dip, beverages in a can, and produce at Burritt’s Fresh Market. Bryant Park at the base of TC’s Old Mission Peninsula has a picnic area, restrooms, charcoal grills, shady pines and a gorgeous stretch of sandy beach. that are breathtaking,” says Alagna. Add in beautiful accommodations, outstanding food and beverage quality, plus attentive and tenured service, and Boyne Resorts serves up a winning combination. » BOYNE HIGHLANDS AND BOYNE MOUNTAIN Find championship-caliber golf, the best in Midwest skiing, tennis, mountain biking and the popular zipline tours. (Guides make the experience fun for all—first-time riders and those more than ready to take the leap.) » INN AT BAY HARBOR “We take people outside and apologize for the view...” Alagna jokes. Adirondack chairs, hammocks, and cabanas offer the perfect vantage point for enjoying the Lake Michigan shoreline and “million dollar” sunsets. Each of the Inn’s 115 rooms was newly renovated, and as an Autograph Collection resort, the Inn at Bay Harbor offers high-end service quality, and an intimate setting that’s phenomenal for smaller groups. HOT TIP Up-and-coming performers, handpicked from across the nation, create unforgettable Broadway-style performances at Boyne each summer. The Young Americans Dinner Theatre has been entertaining audiences since 1978, making Boyne Highlands a Michigan dinner theatre destination. both cross country and skate skiing. You can also enjoy the spa, which is complete with steam spas and heated floors for relaxing inside on a cold day. The Michigan Legacy Art Park is an onsite outdoor sculpture park open year round. Guests can take themselves on a guided tour of the art, attend one of the park’s many tours, or schedule a private tour. The park also includes a beautiful outdoor amphitheater that is a perfect spot for a memorable meeting. “It’s a truly special place,” says Johnson. HOT TIP For those who enjoy their spirits—and a modern yet warm atmosphere—Iron Fish Distillery is just down the road from the resort. Iron Fish is the first farm distillery in Michigan, which means they actually grow and process grains on site. Guests can take a tour of the distillery and enjoy tastings of whiskey, vodka, rum, gin (don’t miss the barrel-aged gin) cocktails, wood-fired pizzas, and of course the peaceful farmstead views. Of fish, ponds & meetings. You know about small fish and big ponds. Big fish swim nearby and danger lurks. There’s no such danger here. Your meeting will be in a pond of its own. It will be equipped with state-of-the-art technology and furnishings. So, you will be productive, your goals met, and your people happy. And when you are ready for teambuilding, the Sleeping Bear Dunes National Lakeshore is right outside our door. The viewers of ABC’s Good Morning America named it the Most Beautiful Place in America. You can bask in its beauty. Or you can golf or fish or shop or spa or enjoy galleries, vineyards, breweries, gourmet restaurants and so much more. Go ahead. Be the big fish. We think you’ll like it. Network Like a Pro Whether you are headed to an after-work event with a dozen colleagues or a conference with hundreds of attendees, it’s good to have some hot networking tips in your hip pocket. We went straight to an expert: Traverse City’s Allison Beers, who has almost 20 years of meetingplanning experience through her agency, Events North. I read somewhere that networking is one letter away from not working. Then, I laughed out loud. Seriously … with as many opportunities as there are out there to mix and mingle, grow your connections and pursue new friendships, there are just as many ways you can make these activities ineffective for your personal and professional growth. Here are some of my favorite tips to make the most of your time and keep your networking encounters successful. KNOW BEFORE YOU GO Many conferences have directories of attendees you can review in advance. Are there exhibitors that you should meet who might help your business grow? Make a plan, put it in writing and seek out the people you would like to meet. WHO SAYS WINGMEN (AND WOMEN) ARE JUST FOR BARS? Nothing gives you more confidence walking into a room of strangers than having a buddy along for the ride—a wingman, wingwoman or wingfriend. The key is to establish the most important ground rule before you walk in the door: you two already know each other, if you find yourselves only talking to each other you must go make new friends together. FRESHEN UP FIRST Take a few minutes to brush your teeth, eat a mint, comb your hair, buff up your shoes a little. You never know who you might meet that could be a future client or employer. PLAN OF ATTACK MAKE NEW FRIENDS You’ve got your wingfriend, fresh breath and you’re ready to network. Now what? Allison Beers moment when you have to decide if you just slowly walk away or stay there to continue to hear a story that has lasted 5-plus minutes and you still can’t catch on. So, it doesn’t matter who is talking. When someone new enters the conversation, make quick intros and get back to the super funny story about Aunt Becky’s cat. IT’S NOT ALL ABOUT YOU I know you want to tell your friends all about what you do, where you’re from, what your pets’ names are, but remember to ask questions about them as well. Make sure the relationship is mutually beneficial for all who are networking. PUT YOUR PHONE DOWN! If you want to catch up on email, stay at the office. If you’re at a networking event, nothing makes you more unapproachable than the sight of you looking down at your phone. Stash it away. If you need to check in on something, step away from the crowd. FOLLOW UP Take the business cards you receive and right when you get home, write on the back of them. Facts that you learned, where you met them, possible opportunities, who you might be able to introduce them to, etc. If you had a great connection, send a follow up email, or stick a card in the mail saying you enjoyed getting to know them. Follow-up is just as important as making the connection. Allison Beers is the owner of Events North, a meeting and event management agency headquartered in Traverse City and serving clients all over the country. Allison also travels the country as a public speaker with Put Your Phone Down! A Serious Yet Humorous Look at Business Etiquette. a meeting in Northern Michigan? Make the meeting more memorable. Tuck a complimentary Vacation Guide into your guests’ welcome bags or hotel rooms. Contact Erin Lutke, Erin@Mynorth.com to request copies. Located in downtown Traverse City, Corner Loft possesses a 120 guest capacity, 3 large projection screens, WI-FI access and a modern rustic - chic vibe. Call for a tour today! granted and we love to play up the amenities of the island,” says Hayward. Eighty-five percent of Mackinac Island is part of the state park system, and it’s almost impossible to get lost—a great place to let kids be kids. Its many trails and secluded lakeside shores are the perfect place for a good trek by foot, bicycle, or horseback. Off the beaten path: Woods Restaurant is a Bavarianthemed hideaway tucked into the interior of the island and approached via horse-drawn carriage. The restaurant is inside a quaint Tudor mansion steeped in rustic charm. Before their meal, guests are treated to freshly popped popcorn while enjoying a game at America’s oldest operating duckpin bowling alley. Just for kids: Grand Hotel is eager to work with you to create unforgettable experiences for your employees and their families. For example, they are currently working with a medical group whose conference will include a “mini medical school” for children to learn about what their parents do at work all day.